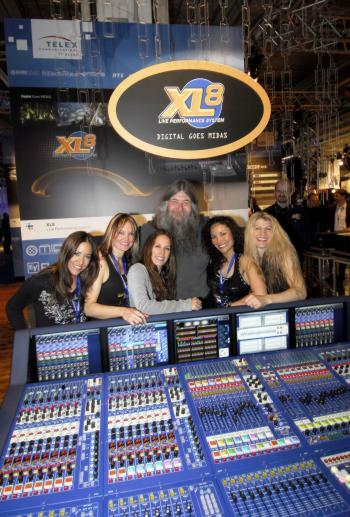 Another leading manufacturer of live sound mixers also chose the prolight+sound show 2006, Frankfurt, to unveil a large-format digital live performance system: Midas marked its entry into the digital mixing realm with the launch of the XL8 console. XL8 is the first of a new generation of open-architecture, cross-platform, integrated audio control and distribution systems, which brings control of not only audio, but other aspects of live performance to a single, intuitive control centre. As well as offering classic Midas audio quality and reliability, XL8 actually improves upon the performance of the analogue consoles which have established the brand as the number one choice of sound engineers the world over. XL8 represents a new generation of networked systems, requiring only microphones, amps and speakers to provide a complete audio system. However, its open architecture ensures that third-party devices can easily be integrated into the system. "Digital technology has now matured to the point where we can offer a mixing system which will conform to all the classic Midas brand values, and won't be obsolete in a few years," says Midas and Klark Teknik brand development manager Richard Ferriday. "Saying that, we certainly haven't designed XL8 from a nostalgic point of view. Rather, we have listened to our clients requirements and moulded today's technology to specifically deliver what they need." XL8 has been painstakingly designed to address the way in which sound engineers approach the task of mixing. A large part of the three-year development project has been to devise a work surface that can be operated from scratch quickly and easily even by engineers new to digital control surfaces. More than 300 engineers and rental company owners from across the globe have visited Midas to provide their feedback and get their hands on XL8. "There is currently no unified control surface for digital desks, meaning that users are locked into working according to how each manufacturer develops their systems, all of which are vastly different, continues Ferriday. One of our main criteria was that the transition to XL8 should prove painless. This applies to mix engineers who have to date seen no advantage in digital consoles, and also to those who have adopted an existing digital system. Key to this was the way that engineers use visual recognition to navigate around a desk, rather than memorising channels in numerical sequences. XL8 has been designed so the engineer doesn't have to think in terms of numbers, pages or layers," says Ferriday. "Users navigate the system and identify channels by colours and groupings, which they themselves create. This method allows an individualised approach to mixing, rather than working within hardware-dictated numerical limitations." Leading the XL8 R&D team has been console design supremo Alex Cooper, the man responsible for the legendary XL4 design a decade ago. "Since I designed the XL4, it has become the benchmark by which other consoles are judged," he says. "The XL8 will raise the bar even higher because it provides more - and better - control from a smaller control surface; it has more - and more flexible - inputs and outputs; it has an even bigger sound and more, improved, onboard processing. Technology and time have made the next generation Midas Flagship possible, but most important of all, it feels right." Midas has created a technical support infrastructure to ensure that engineers are guaranteed service and backup, regardless of where they are located. A 24/7 service centre router will divert calls to one of the main Level 1 service sites in the US, UK, Singapore, Hong Kong and Japan, so that regardless of where the XL8 engineer is, there will be a service centre operating in the same time zone. All five centres will be staffed by technicians who have achieved Level 1 training: spending a week at the UK factory undergoing XL8 network training, assembly from PCB level, XL8 system configuration, fault diagnostics and analysis, plus the ability to train technicians to Level 2. Level 2 in turn will assure proficiency in network configuration and system diagnostics together with the ability to train technicians to this level and to train mix engineers to get the most out of XL8, and these technicians will be located at Midas worldwide distribution centres to provide national assistance. In addition, everyone purchasing the system will become a member of the Midas XL8 Owners Club, which requires Level 3 training several hours of in-depth tuition after which they can gain access to a password-protected dedicated website offering technical support papers and forums where they can exchange data and experience with other XL8 users and owners.